I recently re-started the process or aggregating PHP usage data and first sample of small dataset (about 10 million domains) has been the subject of my PHP Advent article. 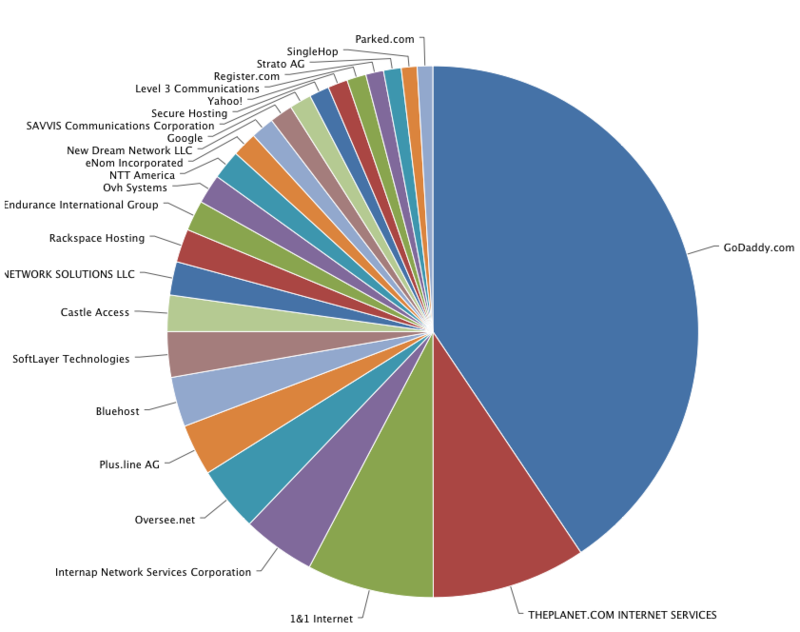 Now, I've started the process of collecting the data on the full data set which comprises of 124 million domains that represent the entirety of .com, .net, .biz, .info, .us, .sk and .org TLDs. First of all, unsurprisingly US has the most domains hosted on its soil, however its sheer overwhelming of other countries is quite impressive, and stands at just over 89 million domains, 71% of all domains!. In 2nd place is Germany (which was actually a surprise, my guess that it would be Canada or Japan) with 7.5 million domains and the bronze goes to United Kingdom with 3 million domains. Canada was actually 4th with 2.7 million domains and Japan all the way in 9th place with 1.86 million domains. 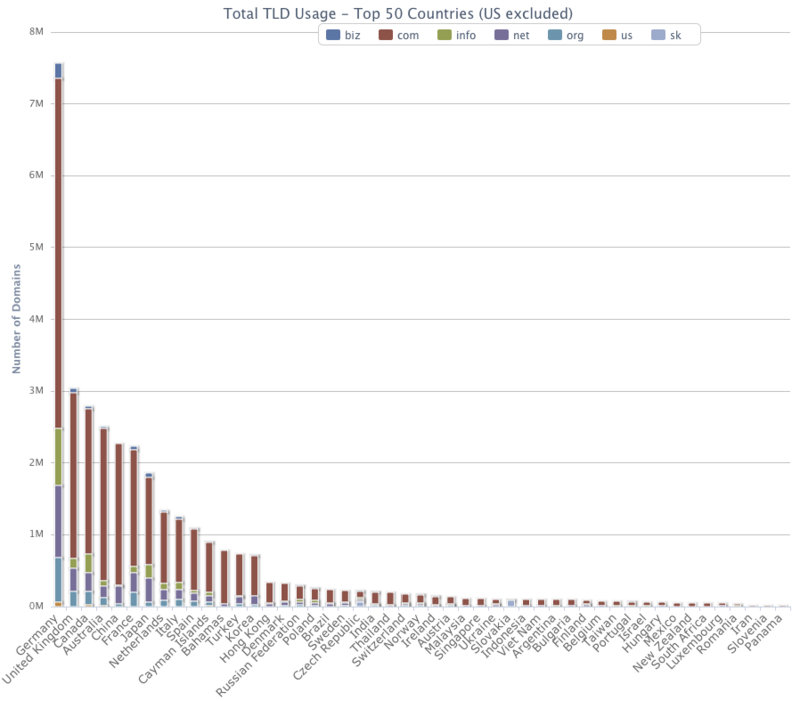 Below is a graph representing the top 50 Countries according to the domain distribution. To see more detail, click on the image which will bring up a zoomable HighChart graph. Note that the US excluded, due to the high number of domains it made the graph not usable and unfortunately HighCharts library does not supposer logarithmic scale. 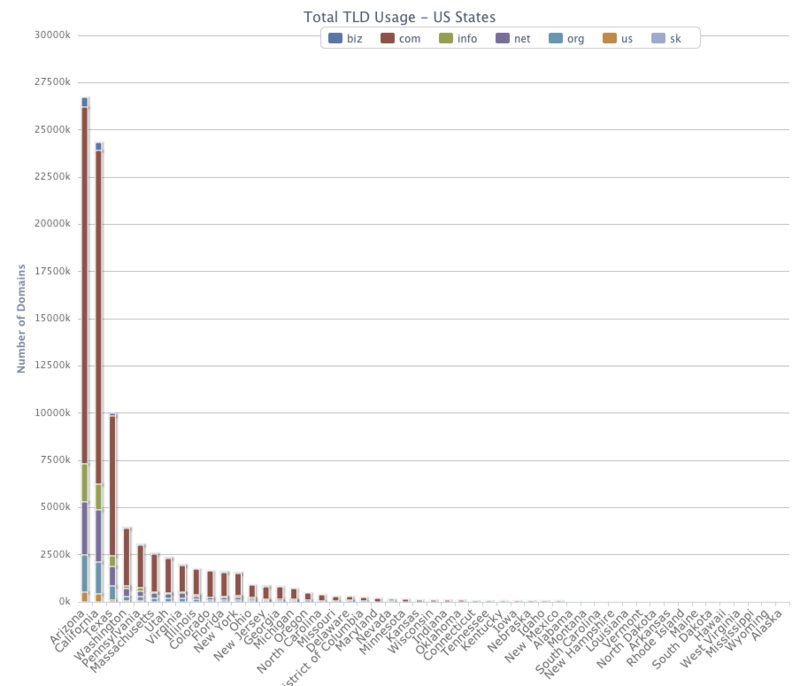 What I did instead is a create a separate chart, which breaks down the domain distribution by US states, which can be found further in the article. As you can tell from the World chart, the domain distribution is highly un-even, the top entry starts with Germany at 7.5 million and by the time hit Spain at #12, we are down to 1 million domains. By the time we get to Bulgaria that is in 37th place were are down to just 100k domains. 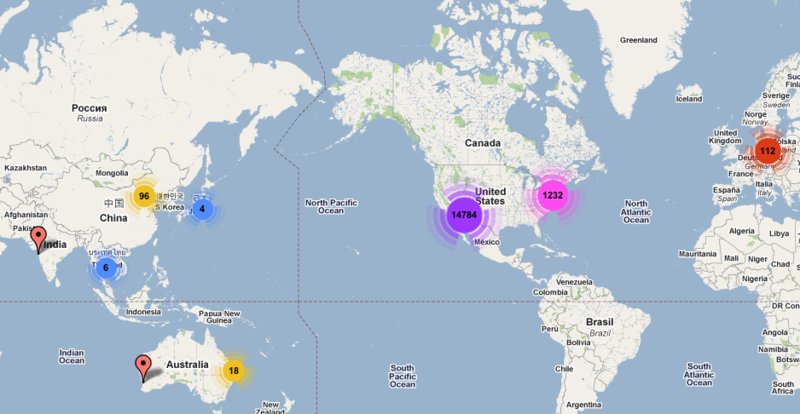 By the time last entry in our chart appears, which happens to be Panama, we are down to a mere 21,709 domains. 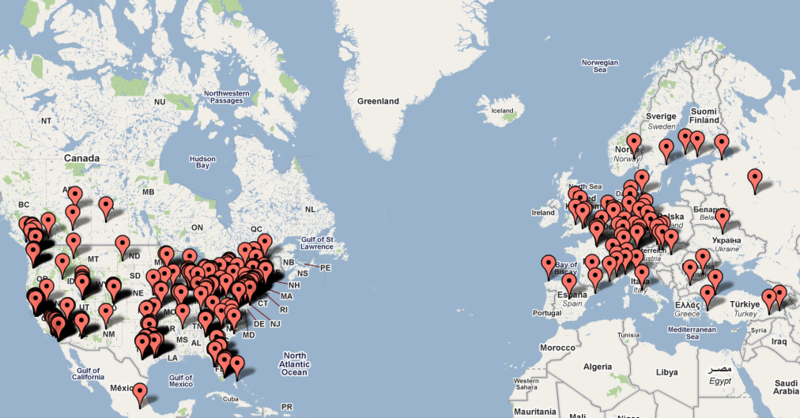 As with the world data, US domain distribution also had a surprise in store for me. I would've guessed that the majority of domains would find their home in California, being itself the home of Silicon Valley. However, California actually came in second, behind Arizona of all states. 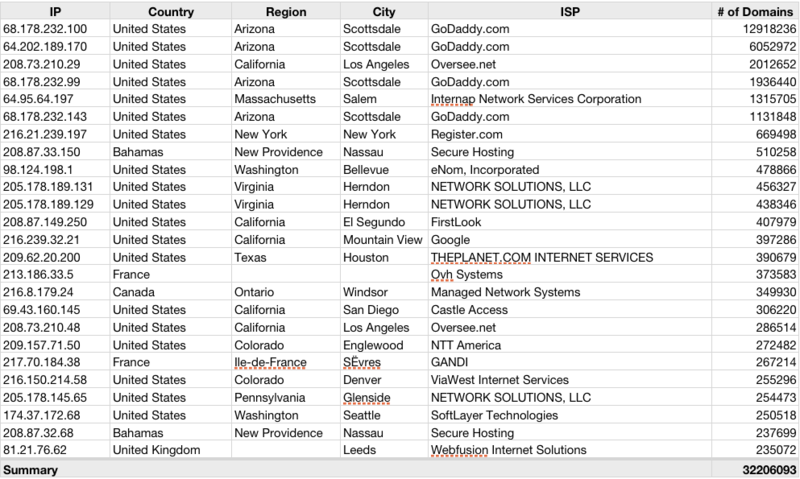 Arizona is home to 26.7 million domains, while California can only lay claim to 24,.3 million, Texas came in 3rd with a mere 9.99 million domains. Below is the chart showing all the states, click on the image which will bring up a zoomable HighChart graph. As with the world stats, the US domain distribution is also extremely uneven, only 12 states can lay claim to being home to over a million domains. The 12th being state, being New York with 1.56 million domains. By the the time we reach Indiana at #27, we are down to just 100k domains. Alaska trails the list at a mere 4729 domains, which seems tiny, however it still more more then 130 countries, which on a world scale would place at at #71, ahead of Iceland an Saudi Arabia, that both have just over 4100 domains. I've also created a clickable world-map that will let you explore all 222 countries, US and Canada are clickable and will give you breakdown of the individual states/provinces. While the sever information script is gathering data, which should take about 2 weeks I am hoping to generate more data based on the IPs, which should give ISP popularity, avg. # of domains per single IP with info on the "top IPs" and other curious bits of info I can gleam from free/public MaxMind I am using. P.S. If you have access to TLDs other then the ones I listed, I would be grateful if you would be willing to provide domain lists for those TLDs on a one-time or monthly basis.